Under new CEO Marissa Mayer, Yahoo is moving full steam ahead with a mobile-first mindset and AllThingsD got a look at the latest Yahoo homepage concept reportedly launching this week. Should the designs be finalized, Yahoo will launch with the new popular tile design featuring highlights from the news at the top of the page, and the remaining stories listed below this. The layout extends to the edges of the page, while its current layout restricts content within a wrapper, meaning that the content is confined to a set width. It’s clear Yahoo has responsive design in mind. This means that instead of viewing a smaller version of Yahoo’s homepage, content will be laid out to best suit the smaller mobile screens. We expect the tiled images to stack on top of the other when viewed on a smartphone. In its current state, Yahoo is incredibly text heavy. With the exception of the slide show at the top of the page, the other images are merely thumbnails. The site has been in need of a facelift for some time now. Not surprisingly AllThingsD adds that there will be fewer text links, which is currently plastered all over Yahoo’s homepage, cleaner icons, and some social integration, although the exact details of these features have not been confirmed. Mayor is ushering in a new era for Yahoo. During last month’s earnings call, she understood that Yahoo had its tentacles in many different businesses without cohesive branding. “We haven’t effectively optimized our websites, we’ve under-invested in our mobile front-end development, and we’ve splintered our brands,” Mayer said. With Yahoo heavily reliant on advertising, which could fetch $350,000 for a single prominently featured ad for one day, there’s financial risk involved. Judging from the screen shots of the current layout, there’s no evidence of placeholders for advertising. But sources from Yahoo tell AllThingsD that ads will likely be added in the tiled feature stop at the top of the page. 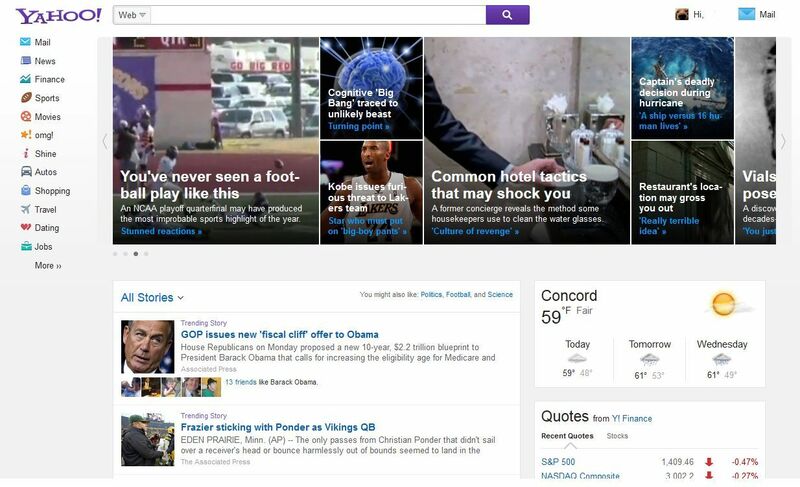 There have been reports that Yahoo has been toying around with other styles of its home page. One concept uncovered by TechCrunch in September copies the iconic Google homepage with a minimalistic look featuring the search bar. Another concept, published by Business Insider in mid-October, is a slightly updated look to Yahoo’s current design, which you can check out below. But based on Mayer’s mobile-first mentality running things at Yahoo, we’re skeptical of the Web-first design that Business Insider published.